Home - Procurement Solutions, Inc.
Watch our 30-second Introductory Video to find out how Procurement Solutions, Inc. can take your business to the next level. 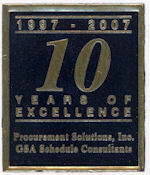 Welcome to Procurement Solutions, Inc.
Procurement Solutions, Inc. (PSI) is committed to our clients. We offer a full range of services to assist businesses of all sizes and types with their Government contracts and GSA Schedule consulting needs. We are at your service from the start of data collection, thru the proposal and negotiation process all the way to the completion of your award and required posting of your documents to the GSA online system. In addition PSI offers more than just GSA Schedule Consulting Services. We offer Marketing Services, Training Services, Proposal Consulting Services and Contract Audit Compliance Services. Look through our website to find out how Procurement Solutions, Inc. can take your business to the next level.